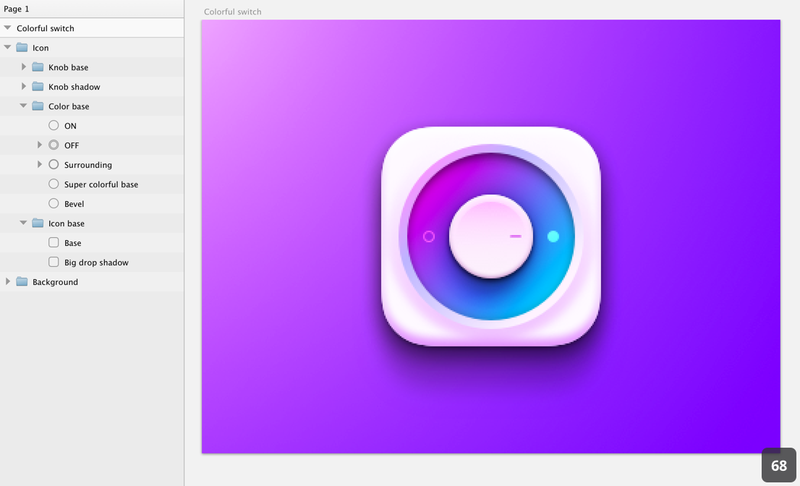 After a bit more than a month using Sketch 3, I feel confident enough to share a part of my workflow in form of a tutorial. 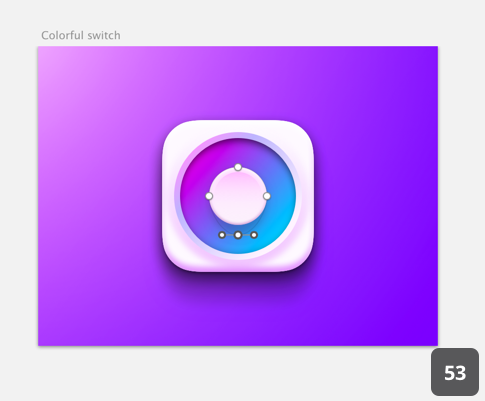 To do so, I’m going to be describing how to create the Colorful switch freebie I made as it uses a lot of interesting features Sketch has to offer and is not extremely long to do. Side note: I’m not all knowing and I definitely do not deliver the holy one and only method to design things so if you have feedback or inputs, please feel free to comment on either this Google+ or Facebook post. I’m always interested in learning things as well and it will be beneficial for everybody. This one is a tough one☺. If you do not already own it, you can download a Free trial or directly buy it from the App Store. Install it and launch it. 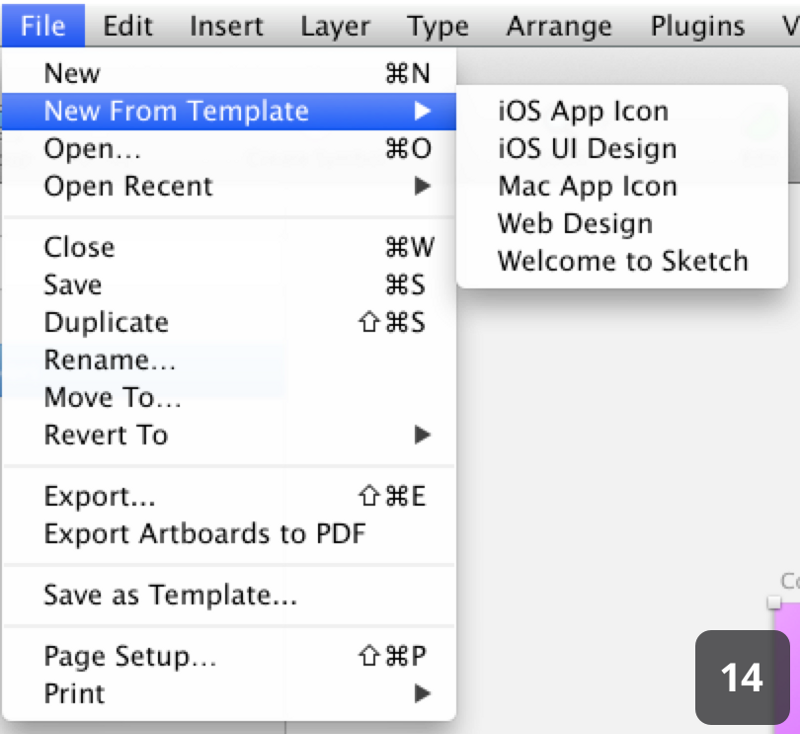 When you see the prompt, do not open any specific template and just click “ok” to open a new document. You’ll see this. 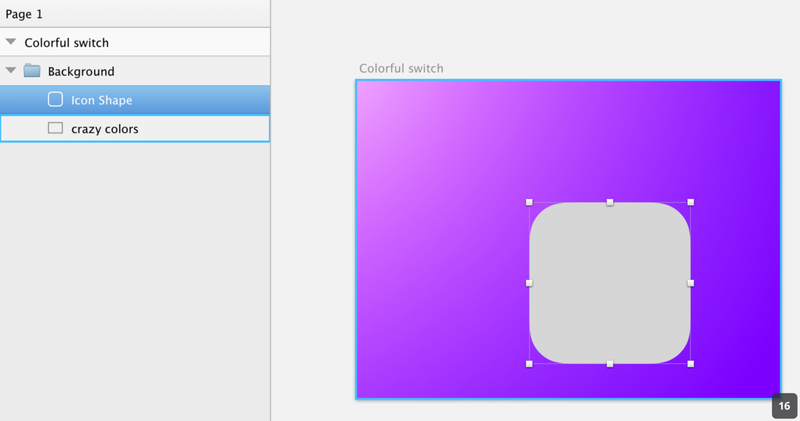 Select your “Base” layer and change the Fill color to #ffffff. 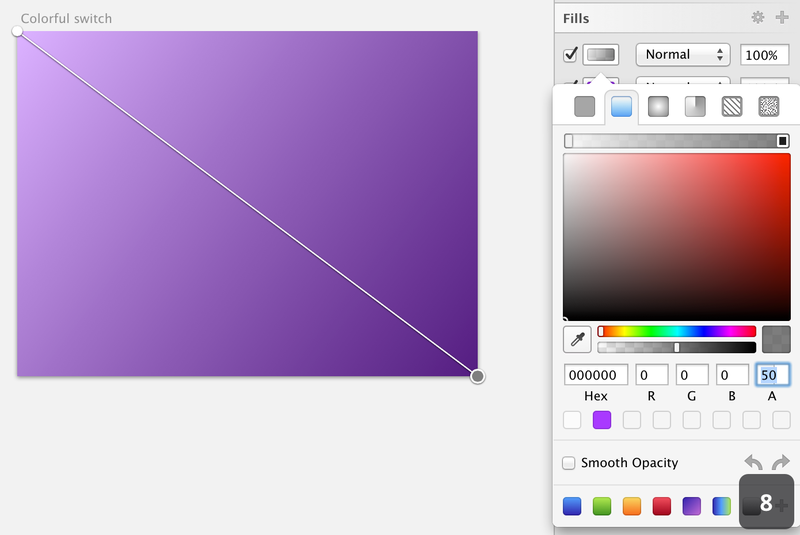 Add a secondary flat color fill to this layer using the “+” button and set it to #FAC3FF. 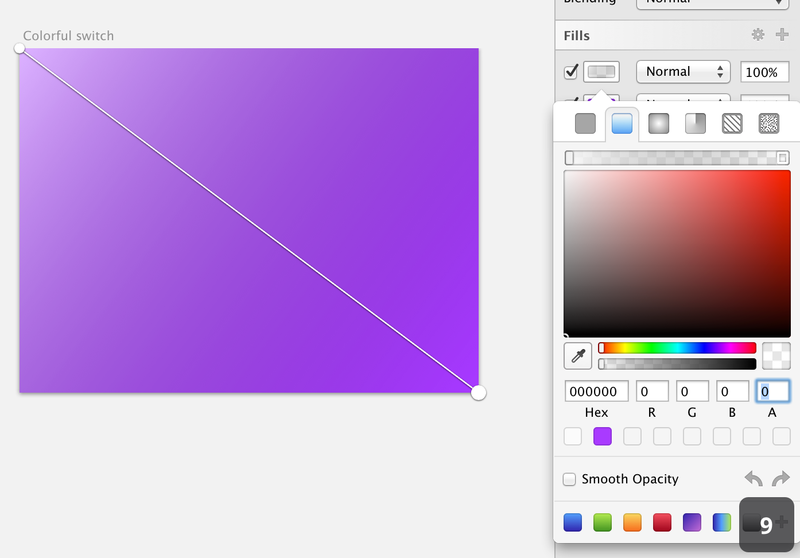 Set the opacity of this flat color to 10%. You’ll end up with image 21. 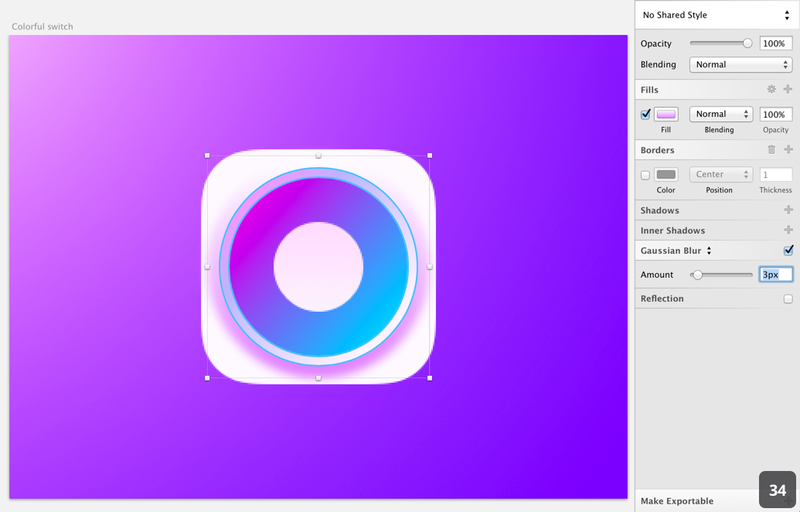 Now hit “O” on your keyboard to select the oval shape tool. 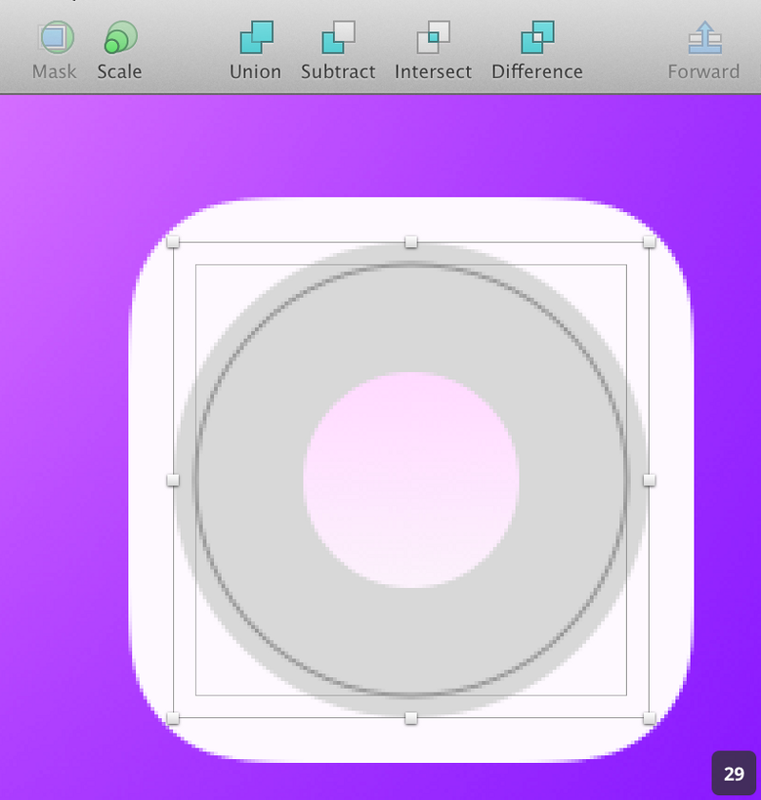 Draw a circle of 124*124 in the middle of your “Base” layer. You can use the right column to get the size right and do not forget to use the align tools we used before to get it perfectly centered. Remove the Borders, you’ll get this (22). Quick awesome tip: To make sure a layer is aligned hold the “Alt” key while pointing at it, it will make the smart guides appear. You can then hover other elements to measure the spacing between them. With the oval tool again, we’re going to create the knob base. 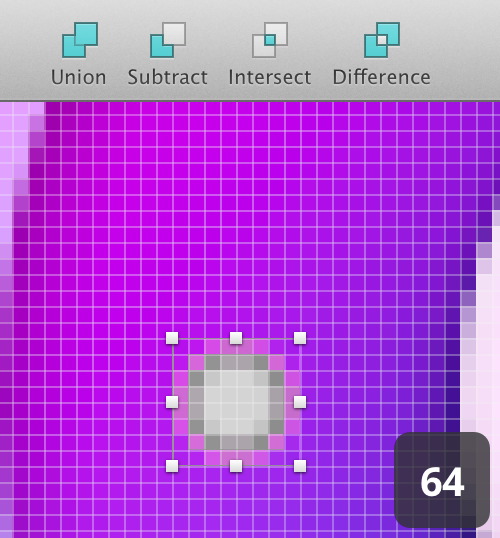 Draw a circle of 58*58 and center it on your “Super colorful base”. 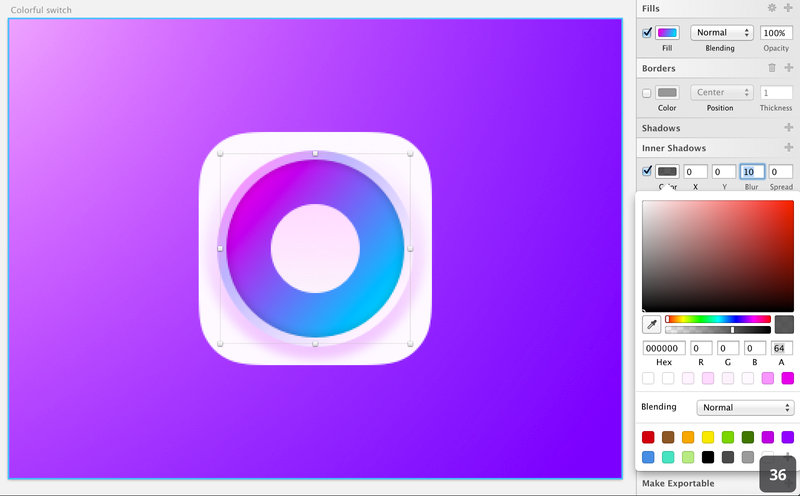 As you can see, we just created the base shapes and zones of our icon. we have the iOS7 shape at the bottom, the colorful circle and the knob at the top. Now what’s left is to add some effects to this flat thing. At this point if you want to make sure you have exactly what you see above, I created a mid-step sketch file. You can grab it here. 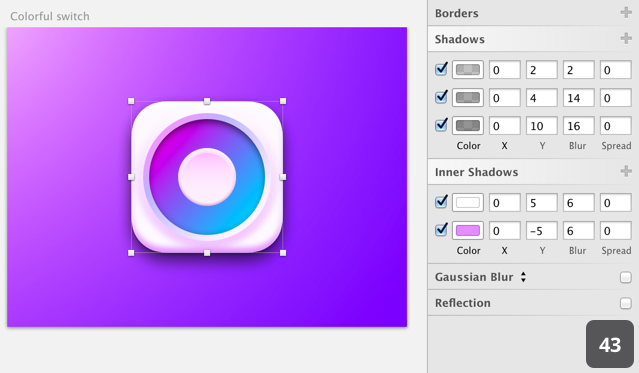 We are now going to spend some time on the “Color base” group. We’re going to create the “ring” surrounding our big circle of color. With your oval tool (O) create a circle of 128*128 centered on the base. Don’t forget that you can use the alignment tool and check everything by displaying the smart guide using the “Alt” key. You should have something like image 27 below. 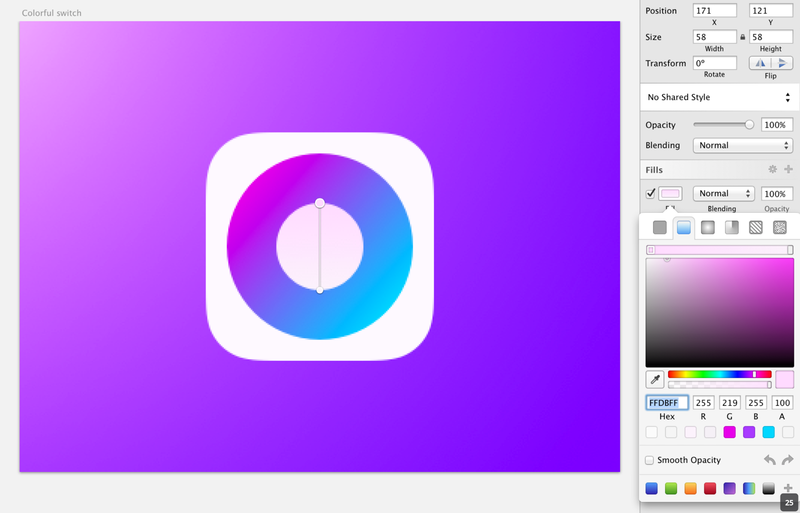 Now again with your oval tool, we’re going to create a smaller circle, perfectly centered on the previous one. 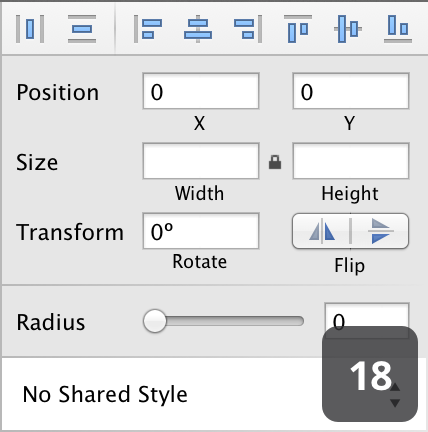 Don’t forget to hold “shift” while drawing and make it 116*116 (28). 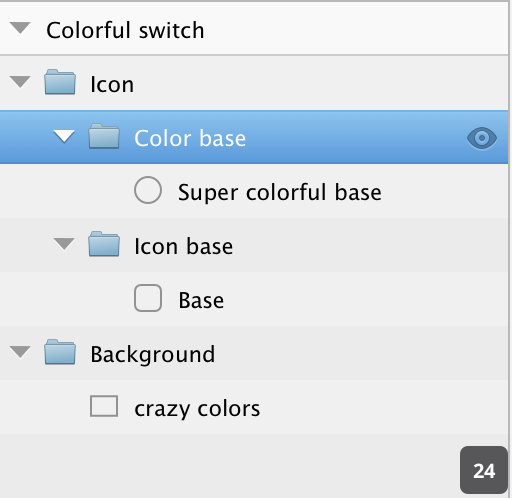 Make sure the most recent layer is on top, select both of them and in the main toolbar click “substract” (29). You will end up with image 30. 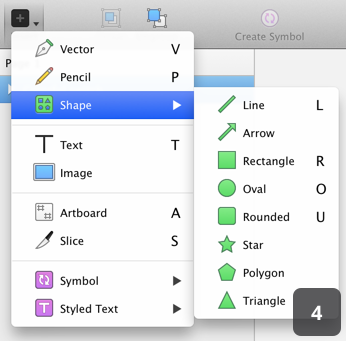 You’ll notice that Oval 3 is now a “shape group”. 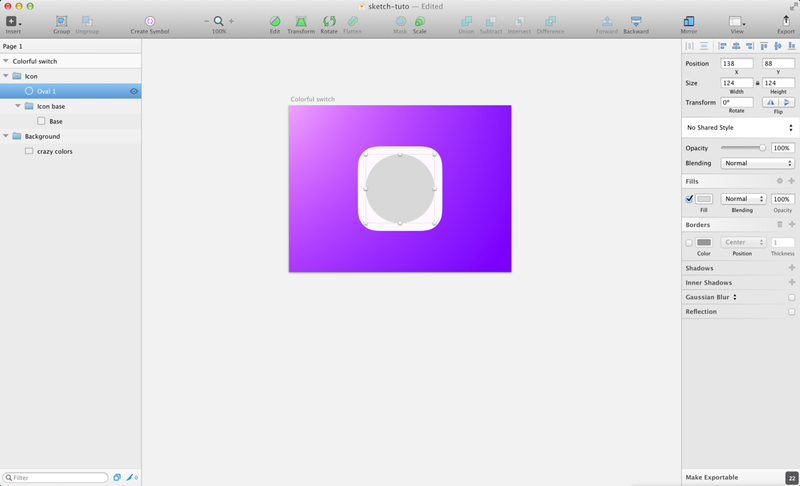 If you open it, you will be able to modify the drawn shapes. 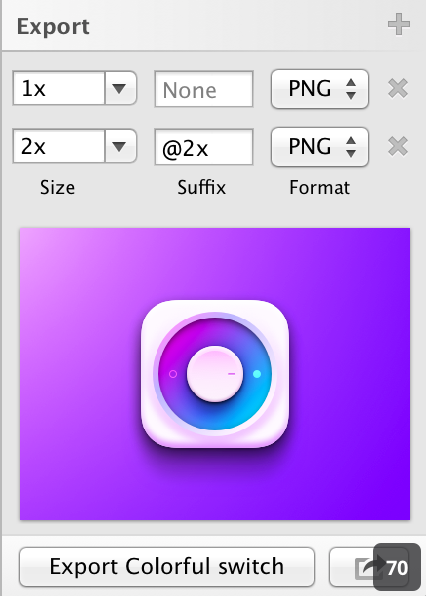 Rename this layer to “Surrounding”. 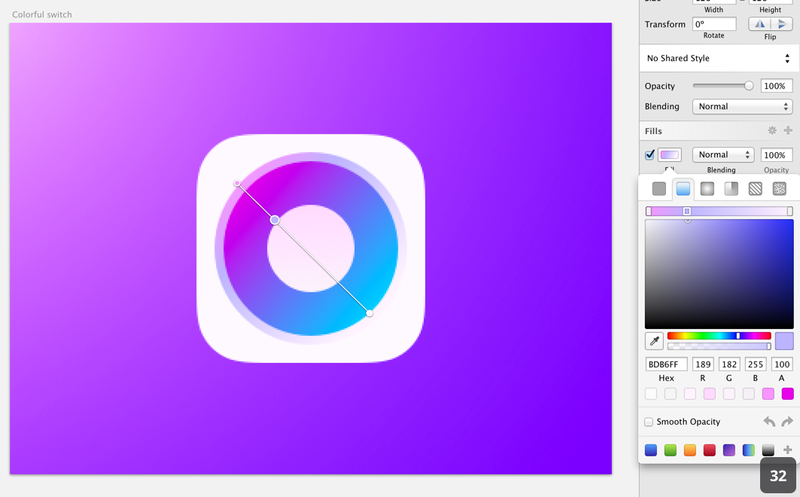 Let’s add a linear gradient on it to create some perspective. 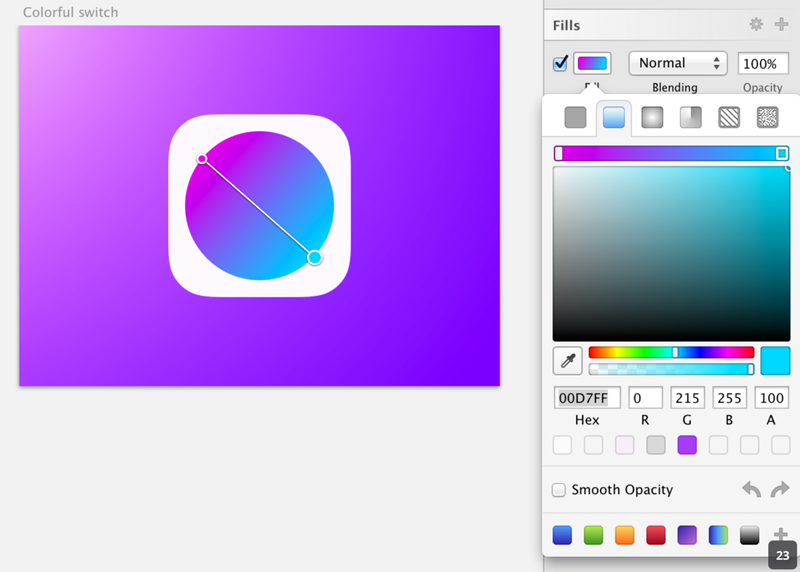 Make your gradient go diagonally from left to right. 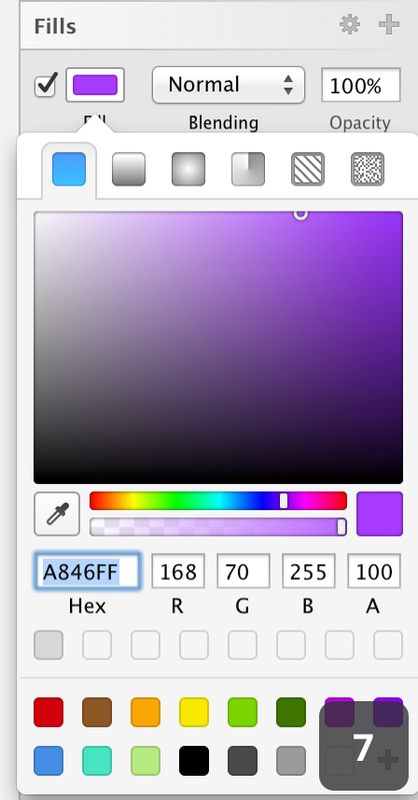 Set the top color to #F698FF and the bottom color to #FFF3FF so it looks like (31). 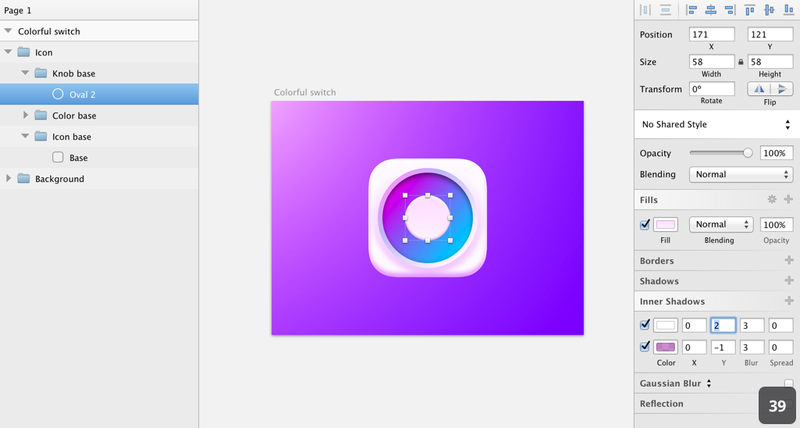 Now we’re going to add an additional color to this gradient to simulate color reflection. 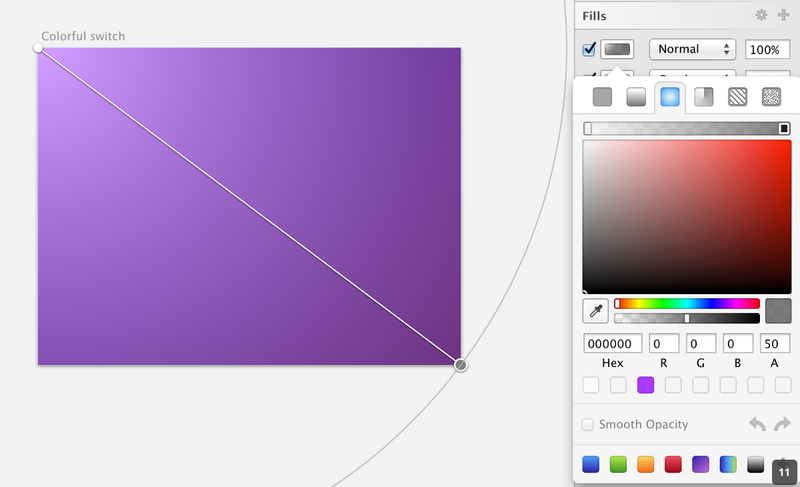 When you hover the stroke representing your drawn gradient, you’ll see your cursor with a “+”. 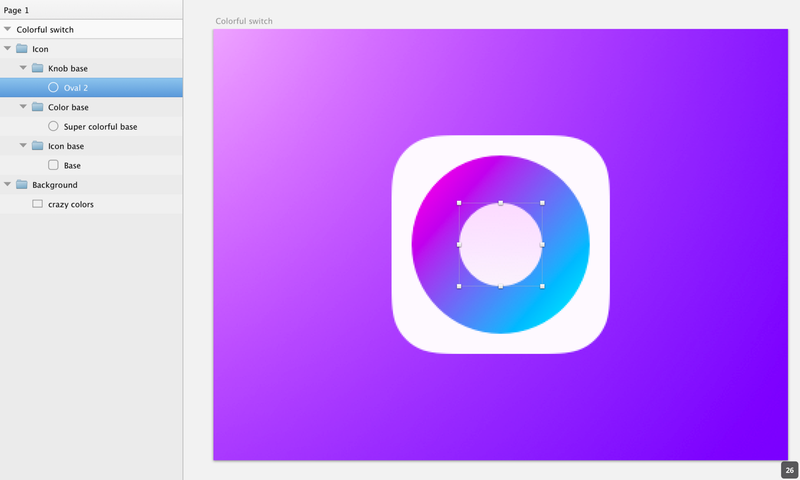 Cicking will add a new color handle to your gradient. Add a new color at about 1/3 of the way down (close to the knob base outline) and make it #BDB6FF (32). The next step is about the bevel. 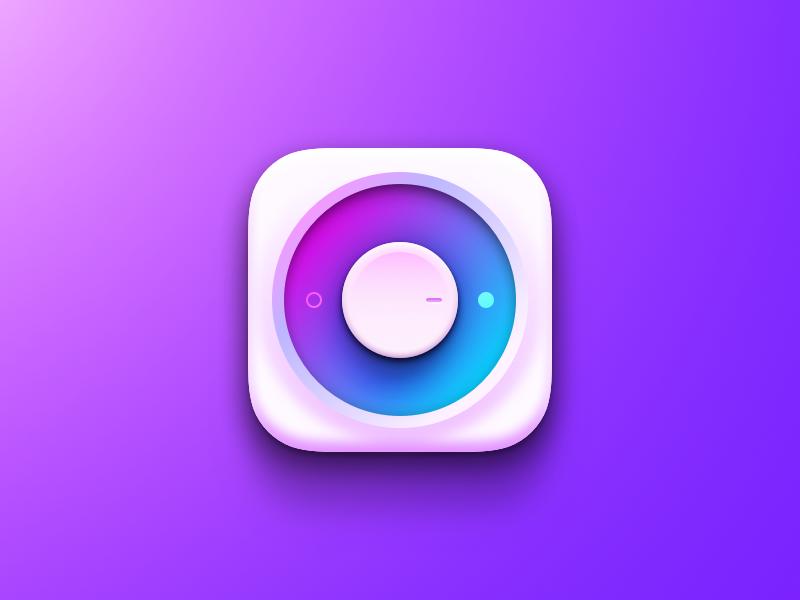 We need to create the little “bump” on the icon. The thing that makes pop the central element out of the base and create a nice 3d effect. 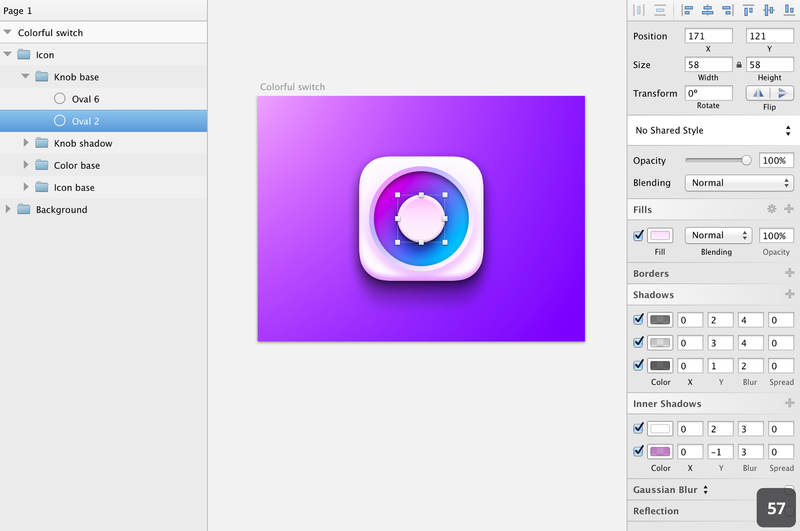 There is no “bevel and emboss” tool ala Photoshop in Sketch to we are going to have to create it using a simple gradient. 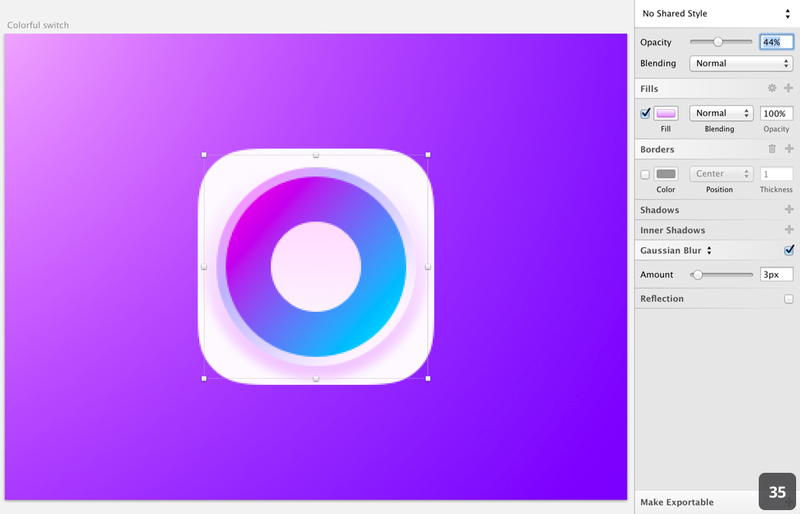 Draw a new Oval (“O” key) of 144*144 underneath your “Super colorful base” layer and perfectly centered on the base. 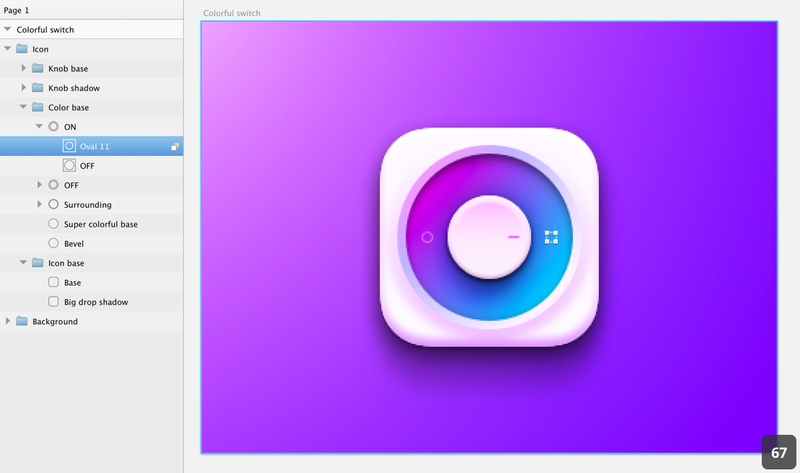 Remove the border layer and add a vertical liner gradient to it with the top color being #ffffff and the bottom color #DF80FF (33). Next step is to blur it so it creates a proper smoothing effect. 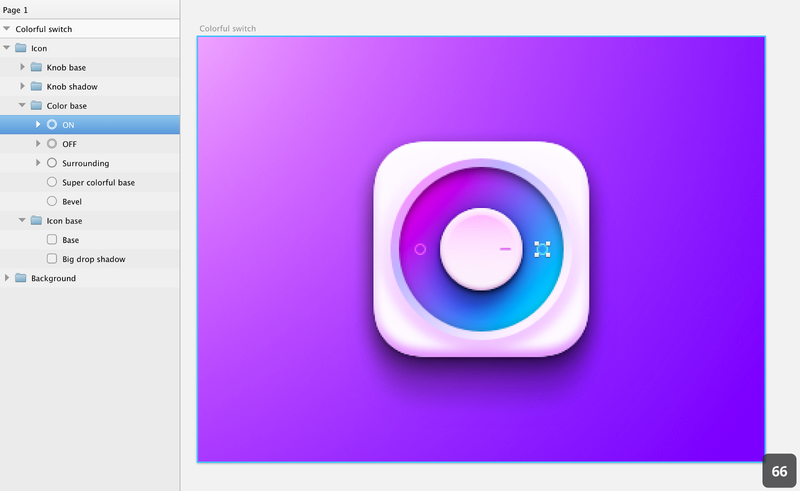 Notice the “Gaussian Blur” row in the right column. 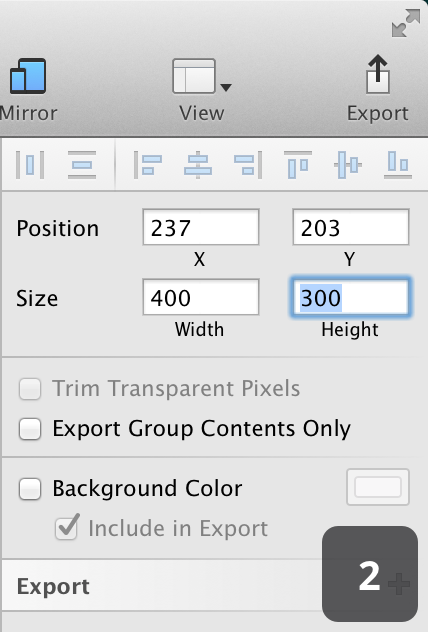 Check its checkbox and set the amount to 3px (34). Finally, set the opacity of the whole layer to 44%(35). Now that your bevel adds some depth to your icon, it’s time to replicate this depth into your colorful circle. 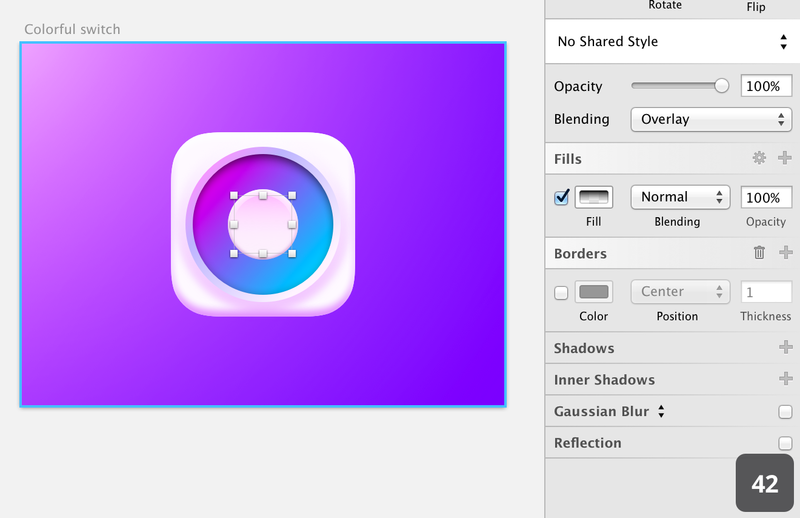 Select your “Super colorful base” layer and add a first Inner shadow by clicking the “+” in the “Inner Shadows” row. Keep the #000000 color but set its alpha to 64. Set its X and Y to 0 and the blur to 10. Keep the spread to 0(36). Add another inner shadow by clicking the “+” button. 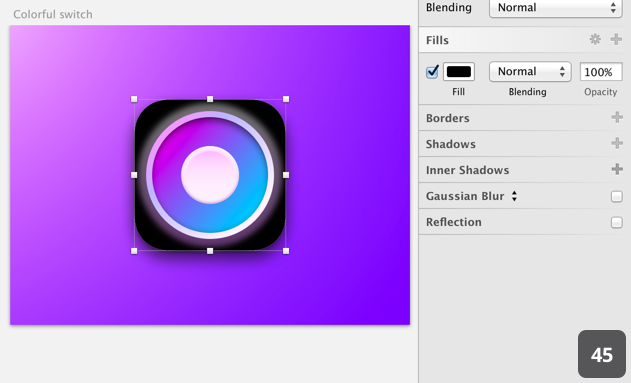 This time set the opacity to 56, X:0, Y:7 and blur to 9 (37). Now that we have a nice bevel on the center piece, it’s time to add it to the base piece so they blend together better. 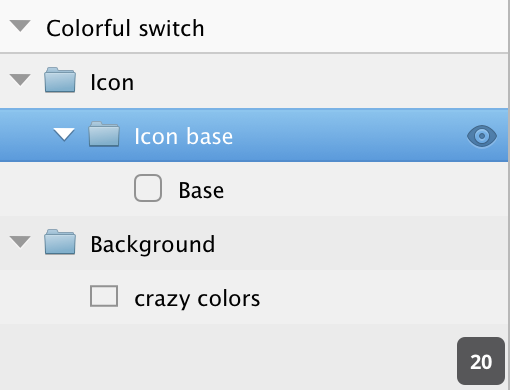 In your “icon base” folder, select your “base” layer. What we’ll need to do is following the same light direction, light on top, darker on bottom which here means white on top, pink on the bottom. 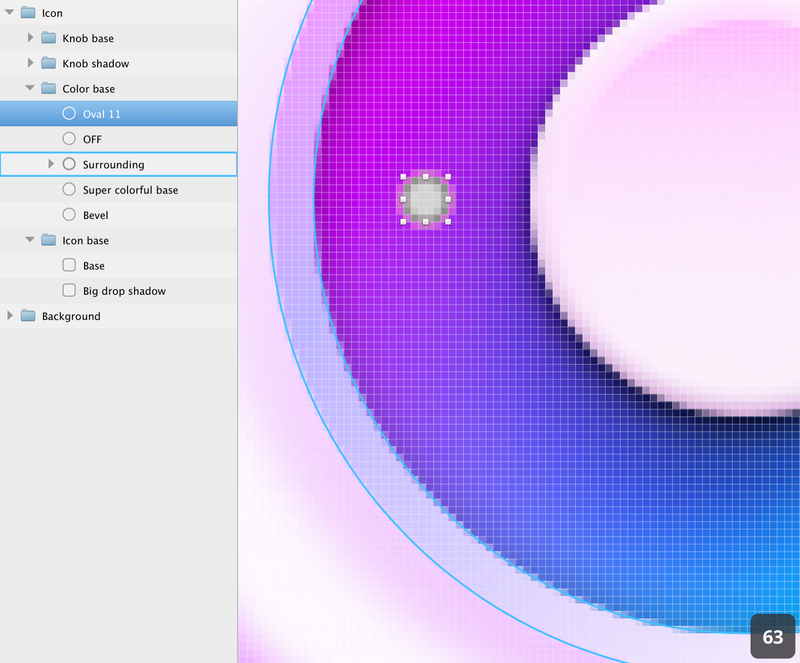 Start by adding a first Inner shadow with the color #E187FF with 90% alpha, X:0, Y:-5, Blur 6 and no spread. 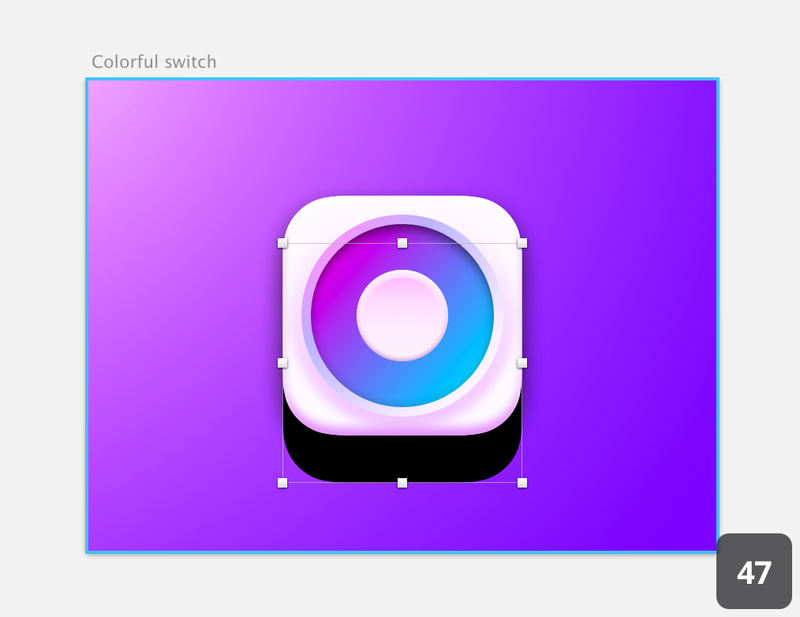 Add a second inner shadow, this time pure white(#ffffff) 100% opacity but instead of making it go up, make it go down with a a value Y:5 (38). Now let’s apply this to the little knob. Select your “knob base” group and then the “oval 2" layer. Apply a first #8D1799 inner shadow with 48% alpha, X:0 Y:-1 and blur:3. Apply a second #ffffff 100% alpha inner shadow with X:0, Y:2 and Blur:3, it will create a nice shine on top of the knob(39). The next step is to carve the knob a bit to make it feel more “touchable” and give it some depth. With your oval tool, draw a circle in the middle of the knob of 48*48 (40). 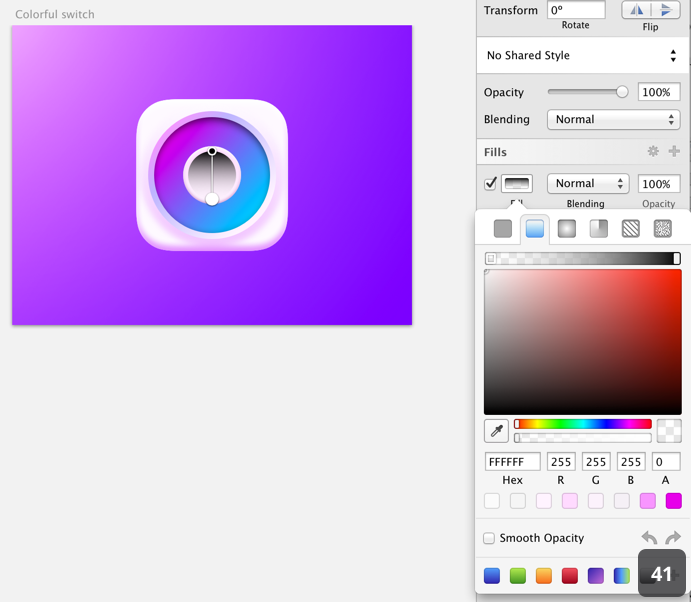 Remove the borders and fill it with a black (top) to white (bottom) gradient. Finally, set the white color to 0% alpha(41). 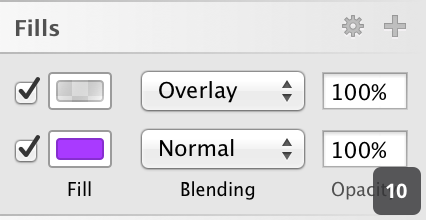 Instead of picking a color for this carving to work, we’ll rely on the overlay blending mode. 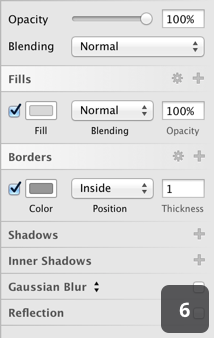 Set the Blending more to “overlay” for the entire layer (42). And just like that your knob just took another dimension. My favorite part. 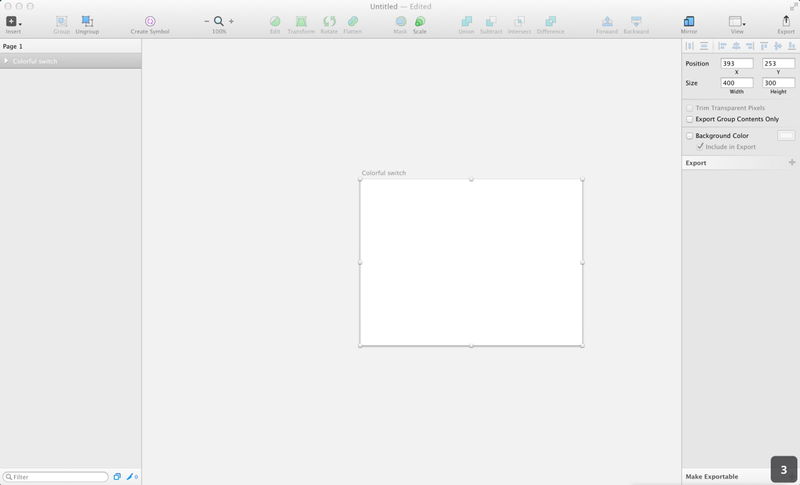 Something that surprised me about Sketch 3 is how well it handles them. There is several ways of creating shadow: using the shadow tool in the layer panel, simple gradients or using blurred out layers. 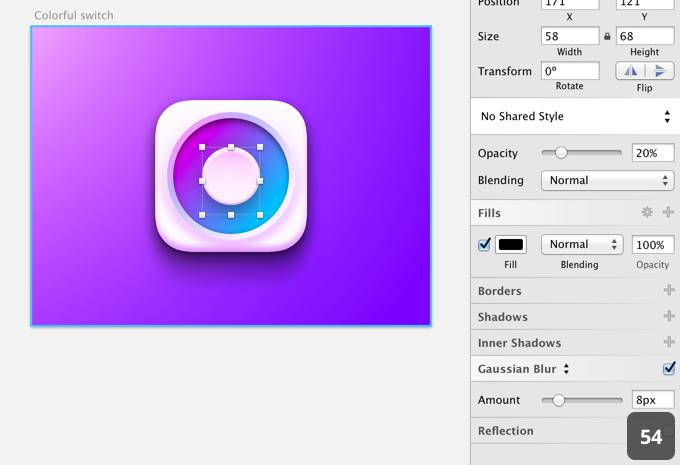 We’re going to use both the shadow tool and the blurred out layer here. You should end up with image 43. The last thing we are going to do to this base is to add a strong drop shadow. 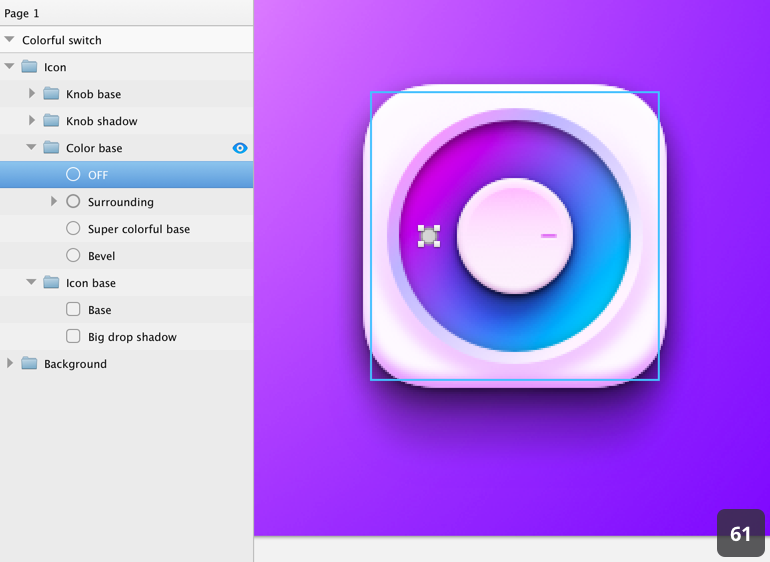 Do to so, duplicate your “base” layer. You can “right click+duplicate” on the layer, copy and paste it in place or click and drag while holding the “alt” key to do so. Once it’s done, you notice that the effect got copied as well. Remove all of them. To do so, uncheck the box close to the item and then hit the “trash” icon on the right of the section label (close to the “+” symbol). Clicking this icon will automatically remove all unchecked effects(44). Set the fill layer to #000000 and you’ll get the image 45. 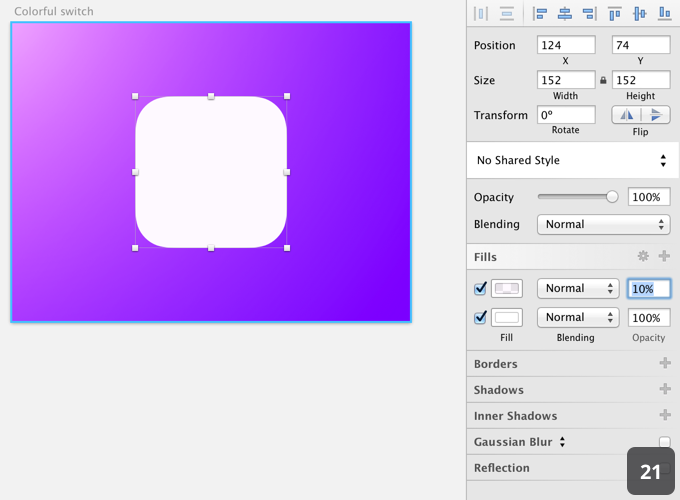 In the layer panel, rename this layer “Big drop shadow” and move it under the “base” layer (46). 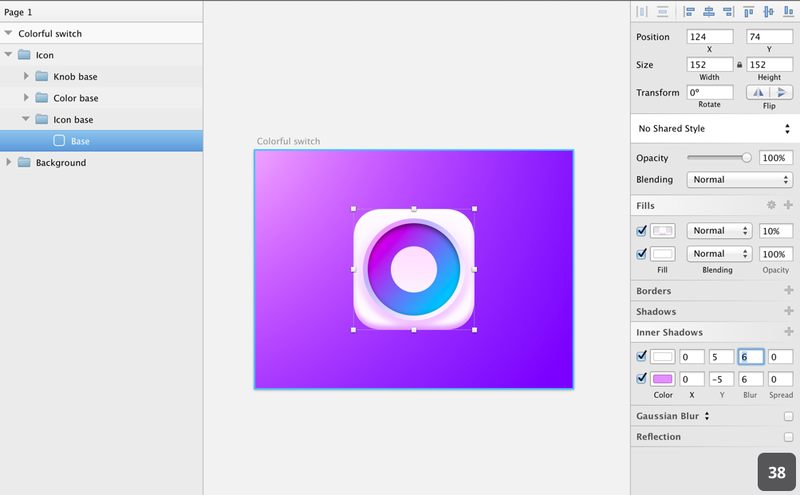 Now we’re going to position the layer 30px down. Select your layer, hold shift and hit the down arrow key 3 times. 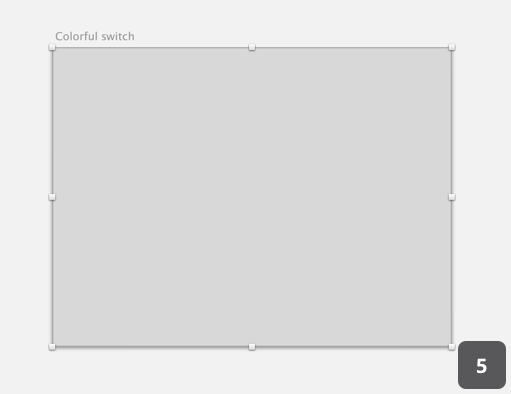 “Shift + down arrow” will make your selected layer move by 10px steps (47). Last step for this shadow, set the layer opacity to 20% and set the gaussian blur to 7px (48). You base now has nice shadows. 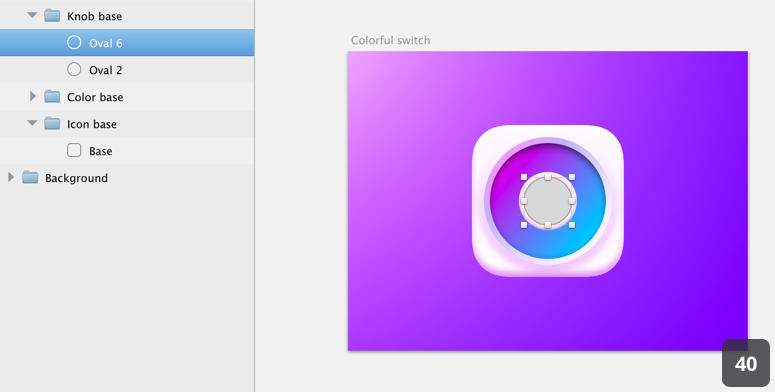 Time to add similar shadows for the Knob. 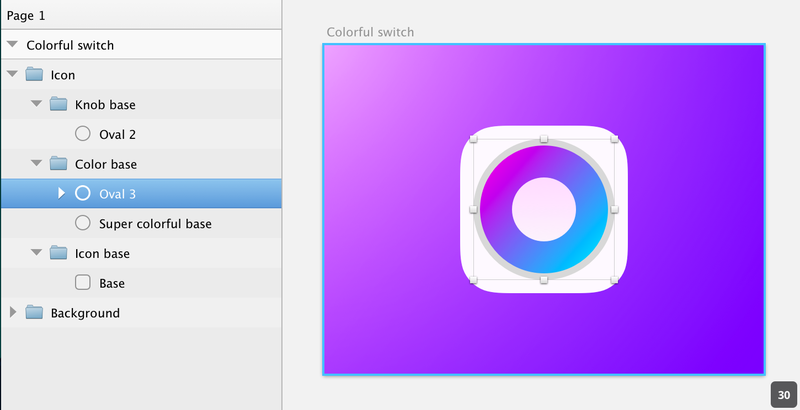 Into your “Knob base” group, select your “oval 2" layer. Copy this layer, pull it out of the group, set it in his own group that you name “Knob shadow” and drag this group under the “knob base” one (49). 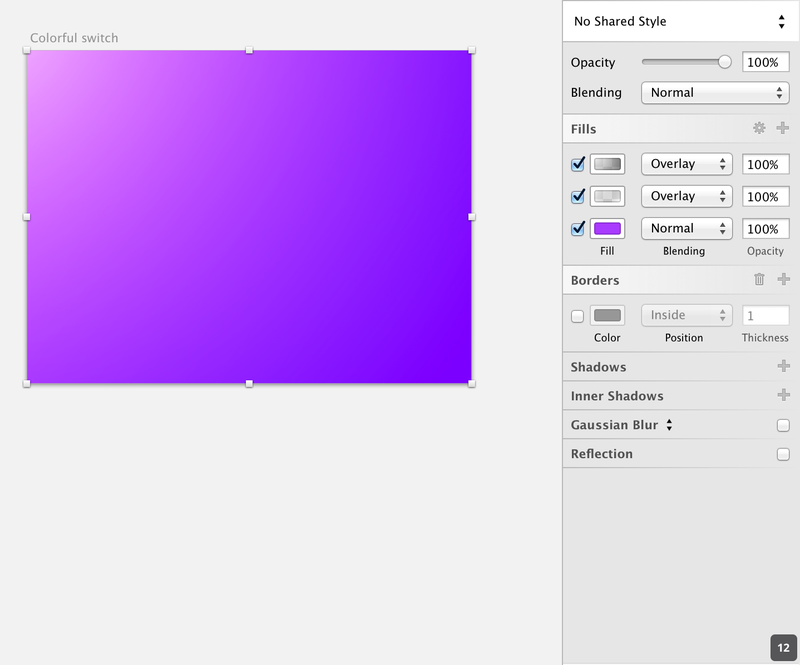 Remove all the effect from this layer, set the fill to a flat #000000 color and move it down 10px(50). Once this is done, set the layer opacity to 10% and the Gaussian blur to 4px, the result will be very subtle(51). Let’s make fancier shadows. 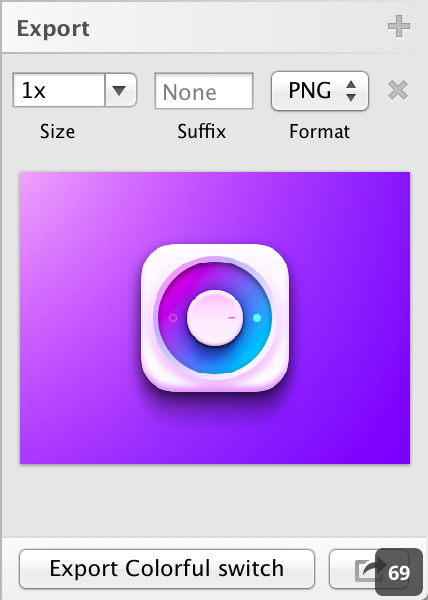 Copy this layer and bring it back 10 px up to align it with the knob. We are going to modify the shape of this circle. With your new layer selected, press “enter(return)” and you will see 52. You are now editing the path. Notice that your right panel has changed. If not already selected, select the bottom anchor (as on image 52). Move this anchor 10px down(53). 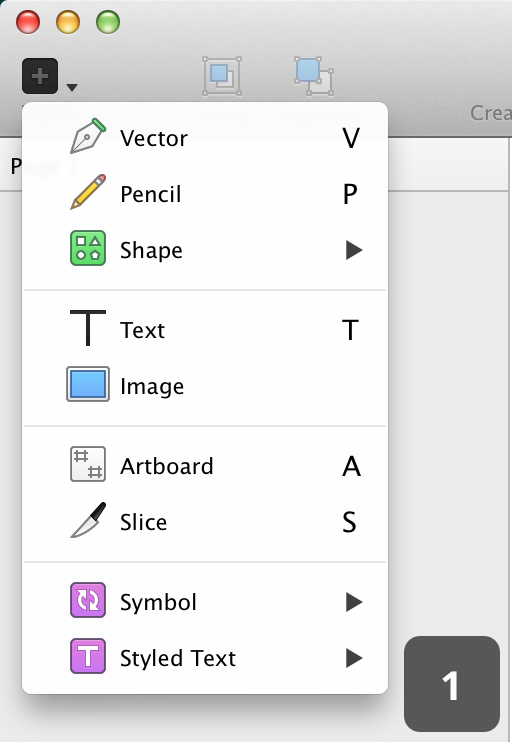 Once this is done, click “finish editing” at the top of your vector editing panel to come back to the regular view. Set the layer to 20% opacity and 8px gaussian blur(54). 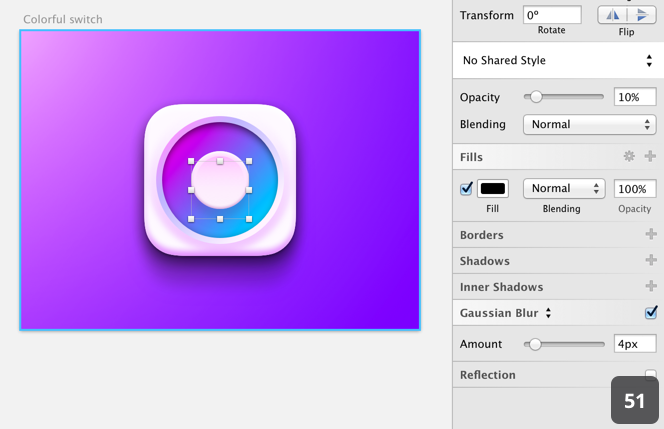 For the last shadow, duplicate the layer we’ve just worked on and set its opacity to 40%. 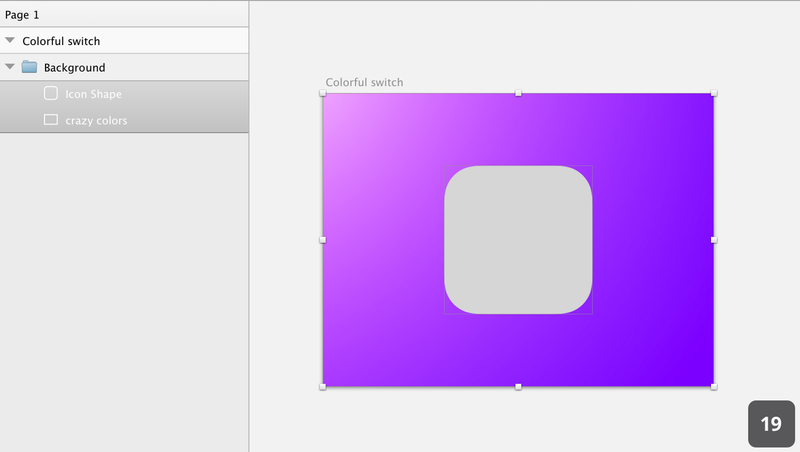 In the right panel, in “size”, make your new layer 68 width by 80 height and center it on the knob, top to top(55). 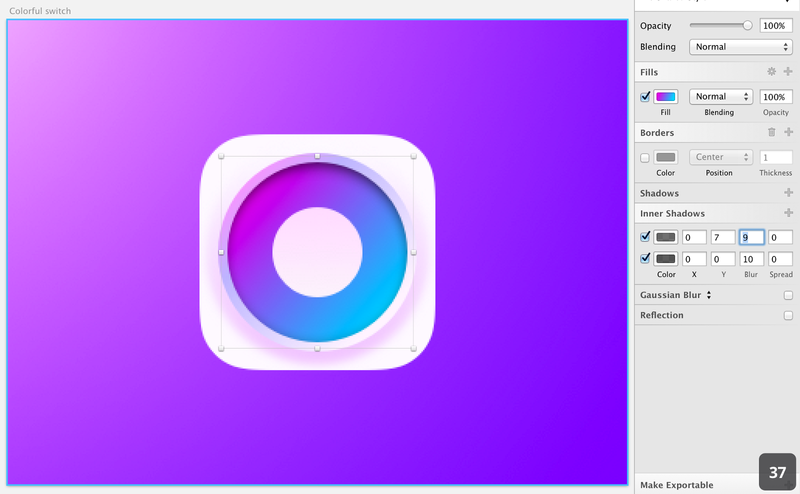 Finally, set the layer blending mode to Overlay to get a nice dark blue shadow(56). We are going to finish the knob shadowing by adding direct effects to it. #000000 60% alpha X:0, Y:1, Blur:2, spread 0. Set the blending mode of this shadow to “Overlay”. #000000 14% alpha X:0, Y:3, Blur:4, spread 0. #000000 50% alpha X:0, Y:2, Blur:4, spread 0. You should see this (57). We are now done with the shadows. To finish, we are going to add tiny thing to make it an on/off switch. In the Knob base group create a rounded rectangle using the “U” key or “Insert>Shape>Rounded” (58) of 8*2 with a radius of 3 or more. Place it on top of your other knob layers and name it “pointer thingy”, I couldn’t find a better name. 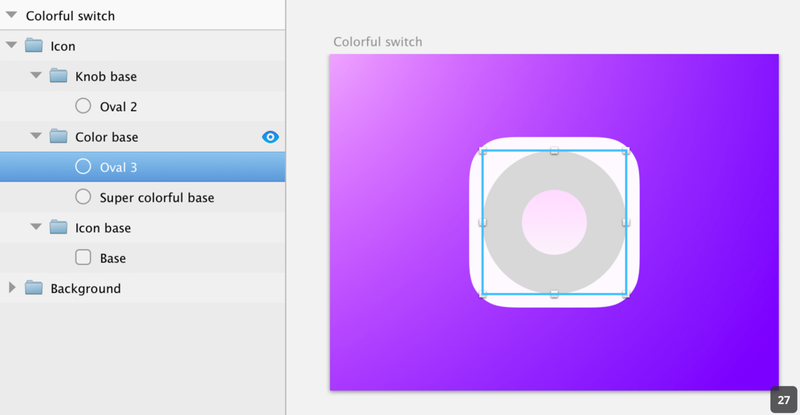 Align it vertically and 8px from the right side of the knob base(59). Remove the borders and apply a flat #CA2DEA color at 40% opacity. 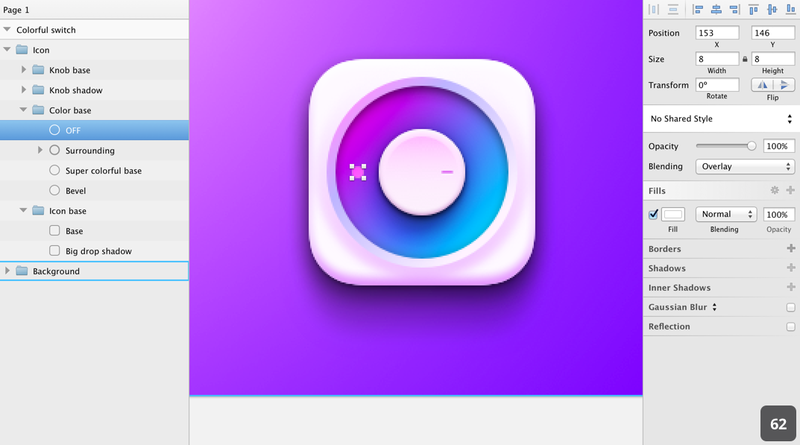 To give it some depth, add a shadow: #FFFFFF 46% alpha X:0, Y:1, Blur:0 and an Inner shadow: #000000 40% alpha X:0, Y:1, Blur:0. Set the inner shadow blend mode to “overlay”, you will get the result in 60. 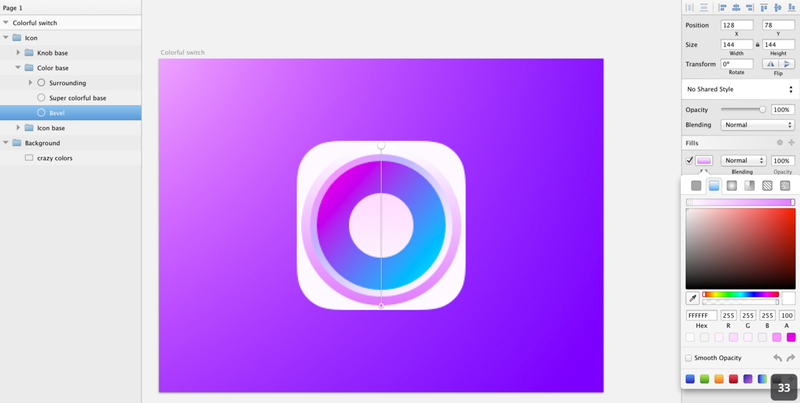 In you “color base” use your “oval” tool (“o” key) to create an 8*8 circle that you will place 10 px to the left side of the knob, centered on the width of the visible color base. Name it “OFF”(61). 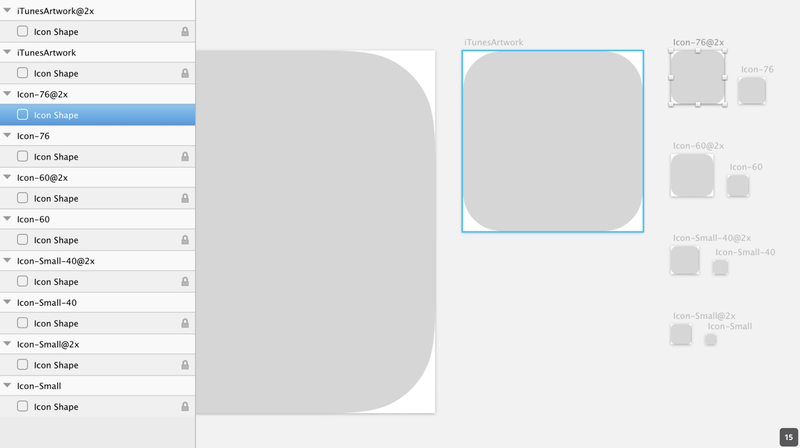 Remove the border, fill it with #ffffff set its blending mode to overlay (62). To really make it look like “OFF”, let’s cut it in the middle. 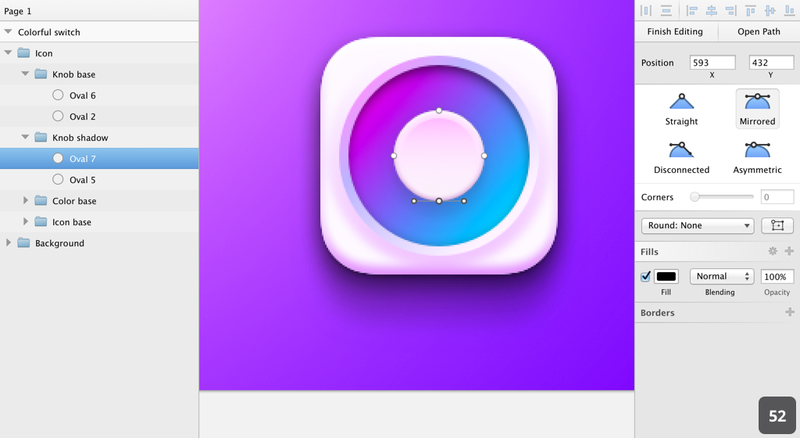 Create another circle on top of your “OFF” layer. 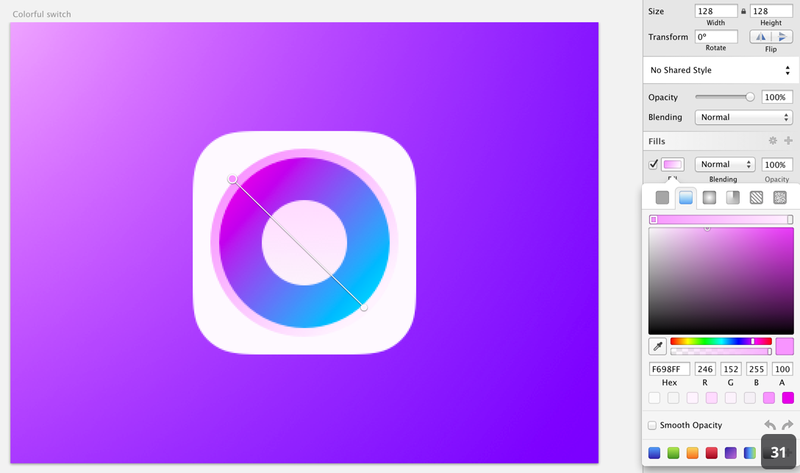 This time make it 6*6. remove the border to see it better and center it perfectly on your “OFF” circle(63). 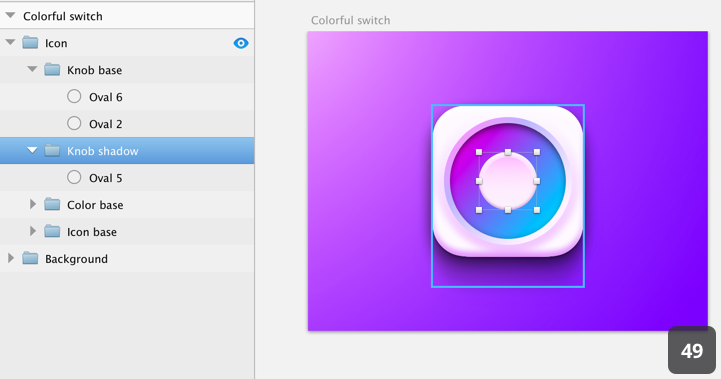 Select both your “oval 11” and “OFF” layers. 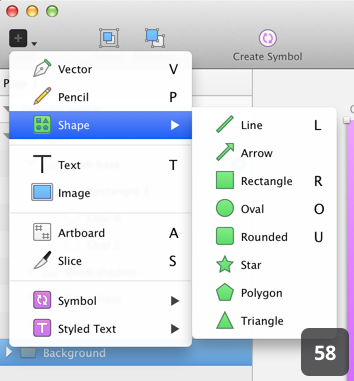 Combine those layers using “substract” in your toolbar (64). You should get the result in 65. 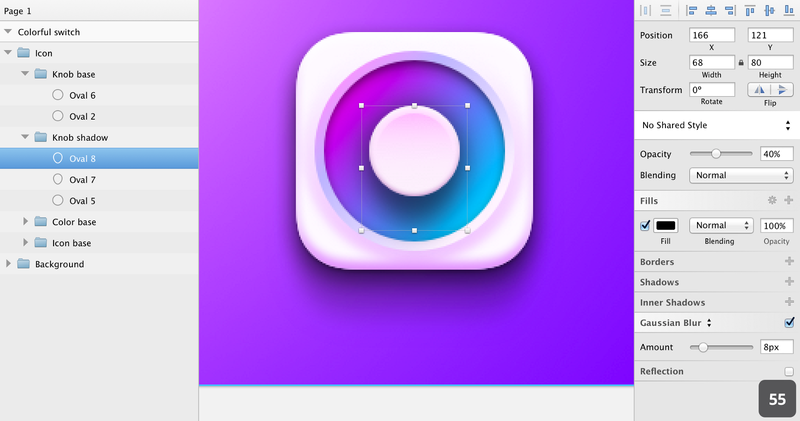 To create the “ON” circle, duplicate your “OFF” layer. Rename it and move it to the other side of the Knob, same distance (66). Click the triangle on the left of the layer to expand the vector group, select “oval 11" (67) and delete it (68). 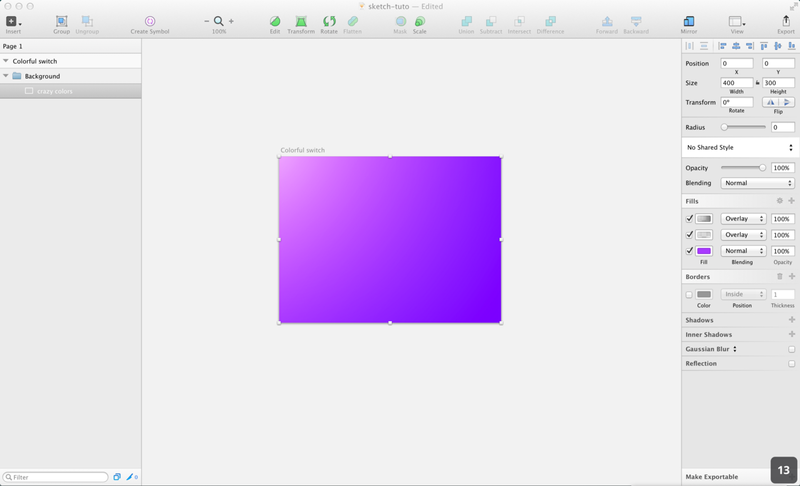 The last thing I wanted to show for this tutorial is the way to export an artboard to several DPIs at once. I think this is an excellent feature. 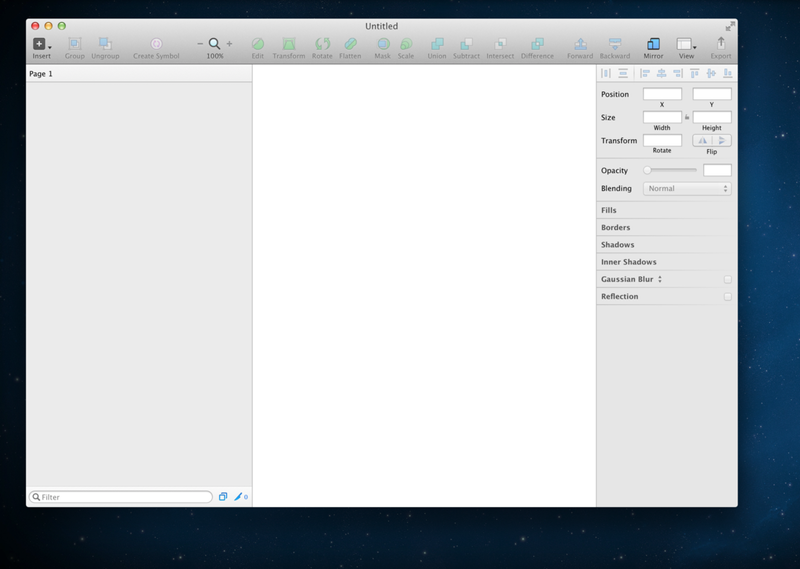 Let’s say you want to export what we just did here in both 1x (the current size we designed for) and @2x. 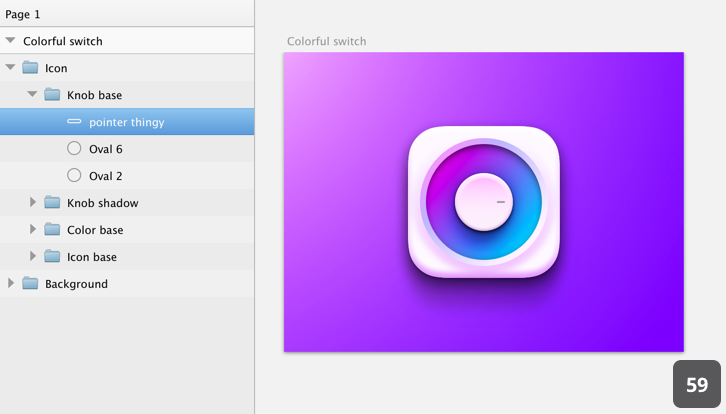 Select your artboard “colorful switch”. At the bottom of the right column, you will see a button “Make Exportable”. Click it and you will get image 69. 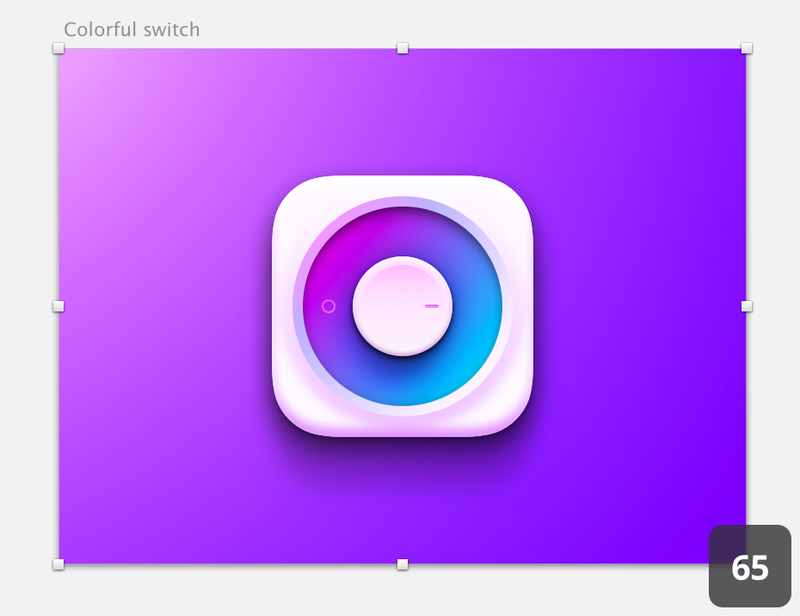 When you click “Export colorful switch” It will generate the 1x, automatically scale your artboard to @2x and generate it in the chosen format and voila! I hope this tutorial was useful for you. You can directly download the final source if you are having trouble with some steps. Edit (11/08/14) @jocelyncaronfr created a very cool time-lapse video of this tutorial, very well done. Check it out on Youtube.